Attendees practiced grading peppers, potatoes, tomatoes and cucumbers using the newly published Vegetable Grading Tools developed by the Cornell Vegetable Team. As project coordinator of the Baskets to Pallets project, much of the work I do is at a desk, coordinating the development of new resources or designing workshops. So, I’m always happy to be in a room resounding with conversation and energy as farmers and food producers meet and learn from one another. This was the happy scene at our Baskets to Pallets Training on March 14th and 15th in Rochester, NY. The Baskets to Pallets Training debuted in the Catskills in 2017 and circled up to the Tug Hill Plateau in 2018. I’m passionate about creating a healthy, inviting space conducive to learning so each time we offer this Training I incorporate more comforts I consider essential for success. Our gathering in Rochester took place at the Irondequoit Conference Center, a light-filled room with access to fresh air. We enjoyed plenty of healthy snacks and meals sourced primarily through Headwater Food Hub. Even at the end of winter, we were still able to enjoy a seasonal menu with local meats, cheeses, seeds, mushrooms and fresh microgreens. We also respect the incredible wealth of knowledge and experience in the room. This Training typically draws 50 farmers of all enterprises from a 100 -mile radius. We had dairy and grain farmers sitting at the table with cut flower growers and urban market gardeners. Some had been farming for over 20 years and some were still writing business plans. Ensuring time in each lesson plan for exchange of ideas, successes and failures is an essential part of maintaining energy and engagement. Many thanks to the team of instructors and buyers for sharing their expertise and perspectives, and Cornell Cooperative Extension of Monroe County for co-hosting this Training. Are you in search of new markets? Have you considered intermediary channels like food hubs, grocery stores, schools and cooperatives? The demand for local food continues to grow…Is your farm business ready for the opportunities? Ensure your success by joining us for ‘Baskets to Pallets’, a comprehensive two-day introduction to selling wholesale. This lively course designed for farmers of all enterprises is taught by a talented and diverse instructor team of educators, farmers and buyers. The Baskets to Pallets Training now features 2 course tracks so you can choose the most useful topics for your farm business. Presentations are accompanied by activities and discussion to give you time to react to the course material and relate it to your own business. Download the entire Course Schedule here. Instructor Team: Read about the trainers and presenters here. Cost: $35.00 per person for the entire Training. Includes breakfast refreshments and a delicious locally sourced lunch each day. Bring a second representative from the farm for FREE!! NYS Military Veterans are eligible for up to $200 reimbursement for this event to cover registration & travel expenses. Contact Dean Koyanagi at (607) 255-9911 for details. Space is limited to 40 participants and early registration is encouraged. The ‘Baskets to Pallets’ course is co-hosted by the Cornell Small Farms Program and Cornell Cooperative Extension of Monroe County. 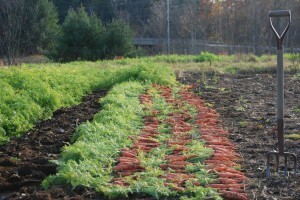 Funding is provided by Northeast Sustainable Agriculture Research and Education (SARE). For more information: Contact Violet Stone at 607-255-9227 or vws7@cornell.edu. Are you a farmer interested in produce safety? Are your markets asking for food safety plans or third party verification? Do you want to understand produce safety issues as they relate to the Food Safety Modernization Act (FSMA) Food Safety Rule, third party audits and Good Agricultural Practices (GAPs)? Participation in this training will give you the tools to create an on-farm food safety plan and complete one of the requirements of either FSMA OR the New York State Grown and Certified branding program. We will also discuss potential funding streams to make infrastructure upgrades to your farm related to food safety! Click here to register. Cost starts at $100/farm and includes 2 registrations, all meals, manual and AFDO certificate. On August 7 and 8, Project Coordinator Violet Stone convened the inaugural gathering of the new Baskets to Pallets educator cohort. In this post, Violet shares a retrospective on who the new cohort is and the work they plan to do over the next two years. Last week, I was happy to find myself out of my office chair and seated instead in the light-filled Loft space at the Carriage House Café with 15 educators and farmers from all over the state. Most of the members of our new Baskets to Pallets cohort hadn’t met before, so we were excited to spend the morning getting to know each other’s passions, interests and niches within the food system. The group then turned focus toward its mission — to facilitate access to new market channels for farmers interested in entering “intermediate” venues such as food hubs, grocery stores, restaurants and cooperatives. The cohort will support farmers and producers who are experiencing cooling trends in direct markets such as farmers markets, community supported agriculture (CSA) operations and farm-stands through providing coaching and training on how to successfully enter intermediate channels. We launched into our work together by looking at big market trends such as the rapid acceleration of online grocery sales and consumer’s growing preferences for local, fresh food. Big trends affect sales for farmers on the ground, and we want to stay abreast of how the food scene is changing and how we can advise farmers to take advantage of new opportunities. Then, we reflected more personally on the marketing challenges and opportunities we were each observing in the regions where we work. Yes, the data tells us that local food is big and in growing demand, but local reports confirm it’s challenging to get small products to big markets and we have plenty of work ahead in getting farmers ready for wholesale and connecting them to scale-appropriate markets. We rounded out our gathering by talking with buyers from throughout the Northeast. Conversations with staff at Headwater Food Hub, Red Tomato and Honest Weight Food Cooperative shed some perspectives on what buyers do and don’t need to have successful business relationships with farmers. Strong communication skills came up across the board, but not all buyers required GAPS/food safety certifications or had hard and fast requirements regarding grading/sorting/packaging. In summary, every buyer is unique and most of the success lies in finding the right producer/buyer match and building a relationship. As educators serving in the Baskets to Pallets cohort, we hope to help farmers navigate potential buyers and support steps toward wholesale success. That might mean supporting a producer in achieving better uniformity and consistency, food safety standards, grading/packaging, labeling, or whatever steps are needed to find success in intermediate markets. So, what’s next for the cohort? We’ll be creating new educational content throughout the Fall in preparation for two regional Baskets to Pallets farmer trainings to take place during the winter months. Do you have any feedback or ideas for our group? We’d love to hear from you. Reach out to Project Coordinator Violet Stone at vws7@cornell.edu or visit the project website. The Baskets to Pallets project is pleased to announce members of the new Baskets to Pallets Educator Cohort. Over the next 2.5 years, members will have the opportunity to work closely to share knowledge and expertise, design and teach lesson plans, meet buyers, receive free coaching and ‘big picture’ perspectives on local food marketing trends from specialists, and trial strategies with local farmers seeking to enter intermediary markets. This project is sponsored by the NYS Northeast SARE Professional Development Program and supported by the Cornell Small Farms Program. Dan Kent of Kent Family Growers shared strategies for how to sell to grocery stores. Over the past 8 years, farmers markets have grown by 38% in the state of New York, giving NY the second highest number of markets in the country. While this growth has provided an abundance of easy-to-access markets for small and beginning farmers, established farmers have started reporting slower sales and customer loss due to increased competition. These farmers complain of ‘burn-out’ from investing significant time and energy in direct-marketing strategies that are yielding diminishing returns. Meanwhile, distributers such as food hubs, grocery stores and restaurants are now recruiting product from small to mid-sized farms to meet growing consumer demand for local and sustainably-grown food. Although technically ‘wholesale’ venues, these businesses are often eager to establish attentive relationships with their suppliers, offer attractive prices and terms, and maintain a product’s branding and integrity. To address this gap in Wholesale Market Training, the Cornell Small Farms Program and Northeast SARE have developed the Baskets to Pallets project. To receive opportunities and information, sign up for the Wholesale Market Watch listserve above. The NY SARE State Program is led by Violet Stone (vws7@cornell.edu). 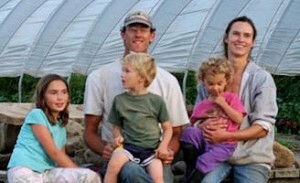 Learn more about Violet on the Cornell Small Farms Program staff page.